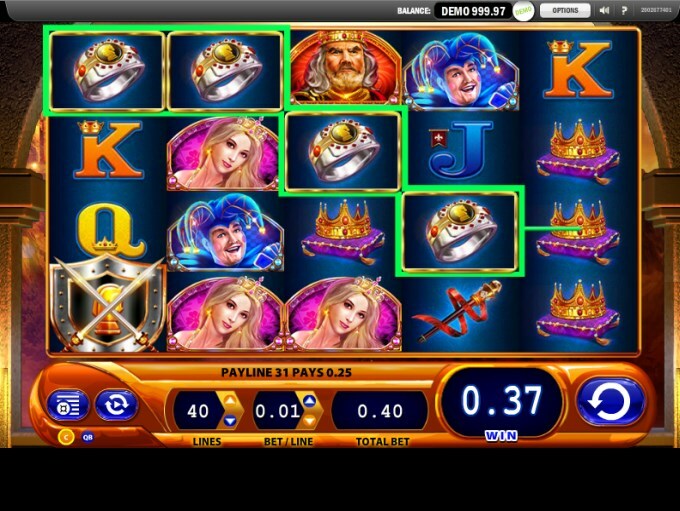 As you can probably guess when you see the title, Black Knight II is the sequel for Black Knight, both of them being slot machines which were created by the WMS designers. The same Medieval Europe theme was chosen for both slots, with similar features being used as well. The design is the one that has changed, the game playing mostly the same in other ways, with the features not changing much. A game which offers you 5 reels and as many as 40 paylines to bet on, Black Knight II has free spins, wilds and scatter symbols as the main features. Its top prizes will give you up to $6,000. If you’re interested mostly in the features which Black Knight II will give you, you will be happy to hear that you get both expanding wilds and scatter symbols, along with the usual free spins. The wild is represented by the Black Knight, which now comes in a stacked symbol that can take over the entire reel it appears on. Only the three reels from the centre get this particular symbol. Though you shouldn’t expect a cash prize from the wild in this game, if you play it long enough you will see it in action as a substitute. Whenever a wild is part of a payline where a different symbol would’ve been more useful, it will take that role and the combo will form. The Feature symbol is the one with the shield that has two swords crossed in front of it. As the scatter, this symbol can appear anywhere on the reel, but the game still needs it to land from left to right with three or more symbols, before it can offer cash prizes or free spins. The prizes go from 2x to 50x the bet, while the number of free spins you are offered is at 7. You’re the one that decides how many lines will be active, and that will determine the number of coins which will be used in the wager. The coin value choice is made by you as well, within the range of $0.01 to $3. With all lines active, that means a $120 maximum bet. The biggest reward that the slot offers will give you 2,000 coins in exchange for the one you used per line, at the same denomination. The maximum value in this case would be at $6,000. The design in this game has remained largely the same as the one from the first slot of the series. It’s still a Medieval inspired game, only now you get symbols which are better polished, though unfortunately there are poker cards as well mentioned on the paytable, and they’re the standard kind. Symbols: Black Knight (wild), Shield (scatter, 50x the bet), King (500 coins), Queen (250 coins), Jester (250 coins), Crown (125 coins), Ring (100 coins), Scepter (100 coins), Ace (75 coins), King (75 coins), Queen (75 coins) and Jack (75 coins). It’s not as feature rich as I like my games to be, but its graphics are pleasant and it’s not a bad slot machine all things considered. The Black Knight II slot machine is offered through the WMS platform, so if you want to play it for real or just to practice, look out for casinos that use it.